Ready to Crack into Uptown’s Cash Vault? Do you feel ready to take on August Uptown style? That means swimming in a pool of money when you spin the reels of Cash Bandits 2 with a 225% Match plus 50 Free Spins for your deposits of as little as $25! Spend your hot summer days alongside the sleekest Cash Bandits 2 that will have you winning quickly when you land 3 or more of the scatter Robber symbols! Trigger the interactive Vault feature where you must enter the correct combination to unlock free games and multipliers! 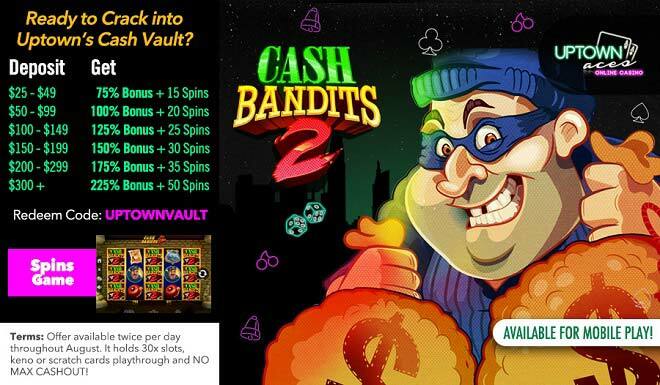 A new winning adventure is waiting for you twice per day throughout August in the Cash Bandits 2 reels with help from huge bonuses and free spins!